Approximately 700 kilometres from Cape Town along the N7 and the R382 on the Atlantic coastline is the very remote town of Port Nolloth. Its nearest neighbour which is approximately 90 km away is the diamond town of Oranjemund which is situated on the Namibian side of the Orange river. Its other close neighbour is the very small village of Steinkopf which if you turned your head to sneeze when passing the village you would miss it completely. 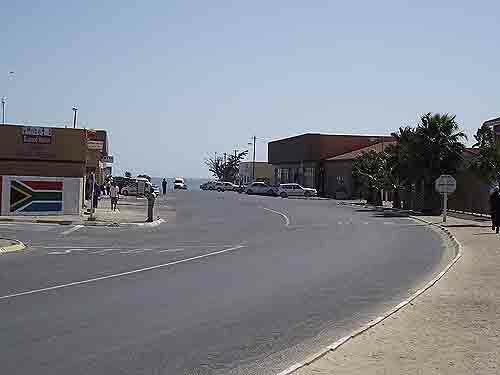 Port Nolloth has had a number of names over the years with its first name being Aukwatowa.The name Aukwatowa means “where the water took the old man away” and was the Nama name for the village. When European settlers from the Cape first arrived in the area there were many seals in the bay so they named it “ Robbe Bay” which translated into english means Seal Bay. The village of Port Nolloth was first established way back in the 1850's after the copper mines had been established in the Springbok area. The reason for the town coming into being was to use its port to export copper which was being mined in Springbok and Okiep at the time. 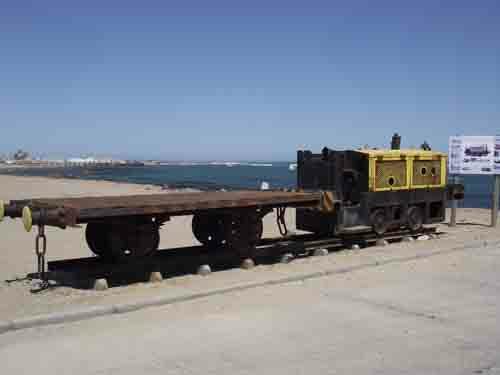 With Okiep and Springbok being about a 140 km away from Port Nolloth it was very difficult to transport the copper ore from the towns through the semi desert regions so a railway line was built from Okiep to Port Nolloth. The first rails of this line were laid down on the 4th September 1869 and were designed for small trucks with light wheel loads which could be pulled by mules. This line was completed in 1871. The mules hauling the trains were linked four in tandem and pulled two coaches at a time. 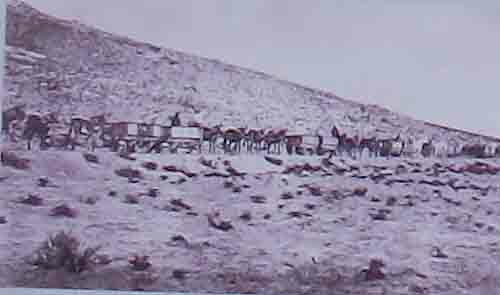 When the trains got into mountainous terrain the mules were released and the trains were allowed to free wheel to the bottom of the hill, their only control being a hand brake which was used to control the speed of the trains. It must have been a pretty hectic ride especially when a load was a little heavier than it should have been. 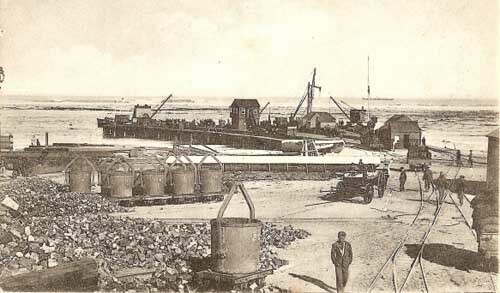 Later small steam engines were introduced and visitors to Port Nolloth's harbour can seen one of them displayed near the new jetty. From 1871 onwards the village of Port Nolloth grew quickly. Once the mule train lines were completed the heaps of copper started to build up near the harbour. 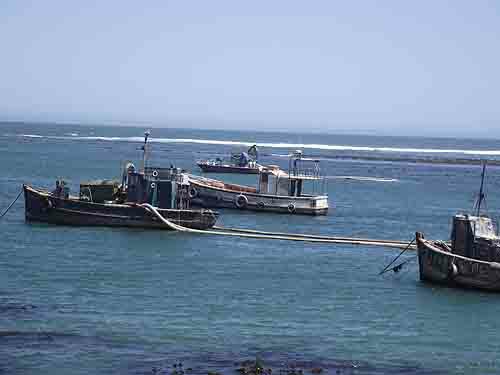 It's quite strange to have a harbour that is protected by a reef and that is exactly what Port Nolloth harbour has. Because of the reef and the narrow channel into the harbour area ships visiting the port in the early days had to stay outside the reef and the copper had to be transported from the quay to the ships on the outside of the bar in the early days. 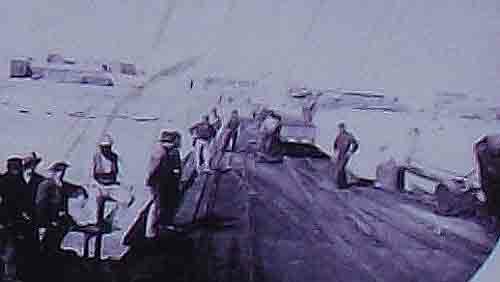 In the 1950's the reef as dynamited in an attempt to make the channel wider and deeper but had very little effect and ships entering the harbour had to be very careful when crossing the bar. In 1925 the first diamond was found to the south of Port Nolloth at Oubeep by a man named Jack Carstens. Ever since then Port Nolloth has been linked to diamonds although the commercial mining of diamonds from the sea only began in the 1970's. 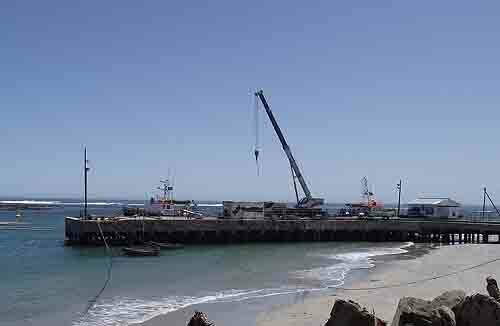 The first time I visited Port Nolloth was in the early 1960's and by that time the town had been modernised and had a wooden jetty which ships that could make it over the reef moored to. This jetty jutted out at right angles to the coastline and was built of wood. I was still a child in those days but can remember that it must have been about 100 metres long to reach the deeper water where the ships lay. The jetty itself extended out over a shelf of rocks that would have ripped the bottom out of any ship that landed on them. In those days there was a lighthouse which was nothing more than a red pole with a revolving light on it situated to the north of the old jetty and which was more or less opposite the channel through the reefs. There was also a coloured lighting system which is still in operation today which either shines a red or white light which signals to the ships whether there is enough water over the reefs for them to enter the harbour. Today the lighthouse is even more weird than it was 50 years ago. The red pole has been removed completely (most probably rusted away) and only the base where it once stood is till there. The light which now operates as the lighthouse has been moved back about 30 metres from its old position. It is now situated on a platform about twenty metres above the ground and is only half the size of the light that used to be there. 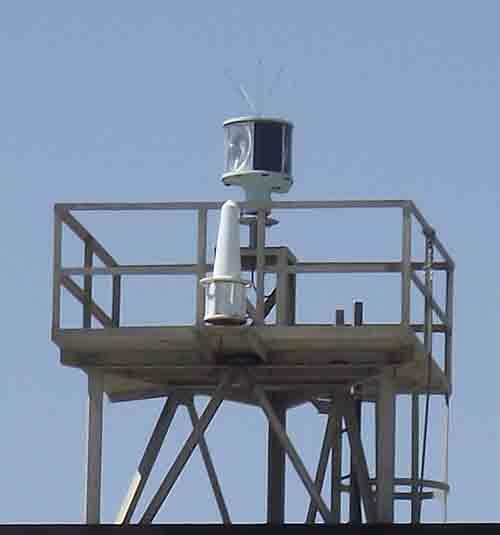 Below and in front of it is a large upside down triangle which serves as a beacon to the ships or boats that enter the harbour. To the north of the lighthouse and on the seaside of it is a large pole that looks very much like a flagpole. 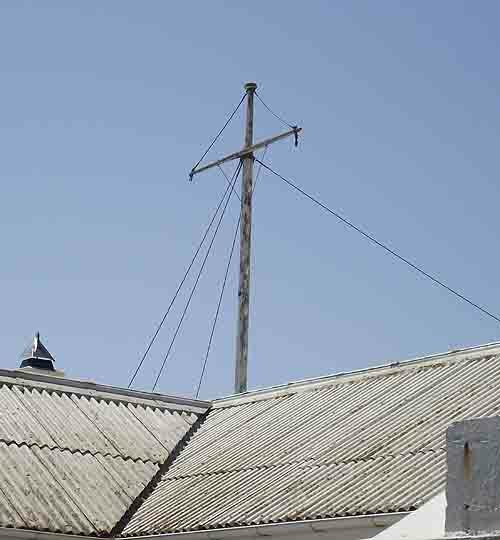 In the 1960's the pole was used to signal ships entering the harbour. A large ball was hoisted up and down the pole and indicated the depth of water over the reef by the height it was hanging. 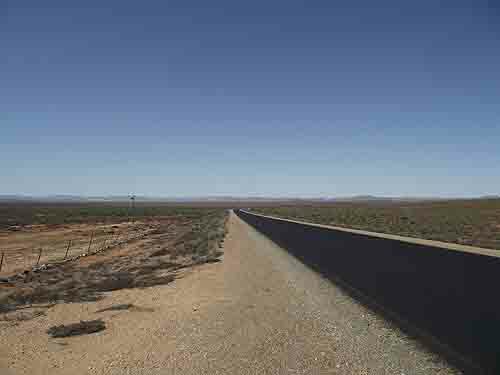 Back in the 1960's the road from Springbok to Port Nolloth was a horribly rough gravel road which took its toll of motor vehicles using it. I have personal experience of it as travelling with my parents in an old Vanguard car we broke both our back springs on the car and had to have them welded in Port Nolloth to be able to get home. On the way back to Cape Town the springs broke again and we had to travel all the way to Cape Town at about 30 kms an hour. What a nightmare trip that was for my father who had three small kids and my mom in the car with him all sitting in the front seat trying to take the weight off the springs. Today however the road has been rebuilt and is beautifully tarred and dead straight. The only twisty bit is the Anenous Pass which is quite spectacular in the rather desolate terrain one travels through. Today Port Nolloth boasts a number of changes from the last time I visited there. 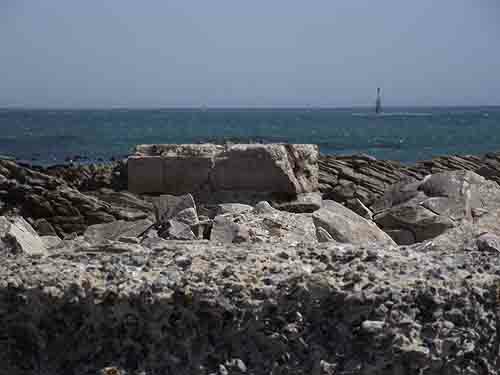 It now has a modern concrete jetty where ships with shallow drafts can moor. The harbour itself is no longer visited by ships such as the Unicorn tanker Oranjemund a unique little ship measuring 61metres in length, with a beam of 12metres and a draught of 4.4metres. Other ships that regularly visited the port were the Unicorn coaster Swazi and chartered vessels Torshammer and Karen Svarrer. In 1972 the Swazi ran aground on the reef into the harbour and it took nearly two weeks to refloat her even though she had specialised equipment on board that should have been used to navigate her through the shallows. In 2006 the Oranjemund was withdrawn from service and no large ships have entered the port since then.. Over the years the harbour has become silted up and is badly in need of a dredging. Because of the silting only shallow drafted boats used in the diamond industry enter the harbour these days. The Atlantic ocean looks pretty placid most of the time but can become extremely rough when storms hit the coastline. A number of boats lying on the coastline bear evidence to this fact. 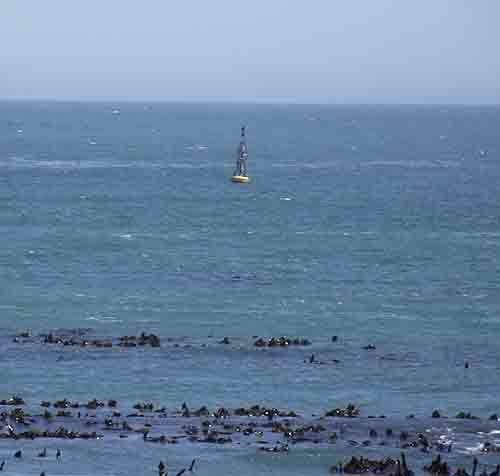 One of them is the Pafuri, a fishing vessel which dragged its anchor during a storm and ended up on the beach. 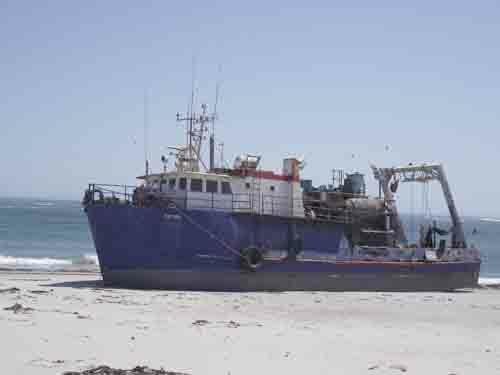 There were plans to refloat her but when we visited Port Nolloth not much had been done and she was lying high and dry on the beach. Nearby a smaller wooden boat lay battered and broken on the rocks, also a victim of the storm that put the Pafuri on the beach. Port Nolloth is not the most beautiful town on the West coast to visit but has a long and interesting history. It has become more of a holiday town with people visiting McDougal Bay to the south of the town to spend time their holidays. The coastline offers fishing and crayfishing in season and there are long walks along the beaches just waiting to be taken. As you will be visiting diamond bearing country when you visit Port Nolloth it is not impossible that you could stumble upon a diamond lying in a rock pool or in the sand near the waters edge. Do not pick it up and forget it in your pocket as possessing uncut diamonds is a criminal offense. If you do get lucky and find one report it to the authorities and stay on the right side of the law. Port Nolloth has a number of places where you can find accommodation so look them up and book yourself a peaceful holiday away from the hustle and bustle of city life. Port Nolloth is waiting to welcome you.